Suffice it to say, then, that while we believe our James Wilson, Sr. (1704-1776) to have emigrated from Bellyrashune, County Derry, Northern Ireland around 1736, he could have resided in at least two of the counties, and some of his descendants in all three, without ever having moved. A second thing to consider are the land claims and disputes affecting those counties in the early years of William Penn’s “Holy Experiment.” While this Quaker and British citizen canvassed Europe for families willing to settle in his land grant in the 17th century, his family had various parcels surveyed for their own personal use after he died. In 1736, one of the largest, 43,500 acres southwest of modern day Harrisburg, was patented as “The Manor of Masque” (or Maske), after an old English estate owned by distant relatives. Stretching 6 miles by 12 miles, it encompassed what is now Gettysburg. The Wilson estate in Hamiltonban Township fell within, as did Our William Hill farm in Liberty Township. More about that later. James Wilson, Sr.’s granddaughter, Jane (1777-1865) married the son of William Hill, John (1775-1849), thus producing my paternal grandmother Hill’s line. As an aside, the Hill name appears frequently among the affairs of the Penn family in this part of the State: William, witness to the will of Chevall Penn (1671), and John, the overseer of the poor in York County (1750), for example. Research continues for any possible connection between our Hills and the Penns. We might also mention that our William Hill’s wife, Elizabeth Dixon, may have a connection to other namesakes of that time and place: surveyors Charles Mason and Jeremiah Dixon (1733 –1779), who helped solve the border dispute between the Lord Baltimores and the Penns; James Dixon (1710-1768), for whom Dixon’s Ford is named; and several others. The Marsh Creek we mentioned above is the site of the Lower Marsh Creek Presbyterian Church and Cemetery, where many of our early Wilsons and Hills are buried. 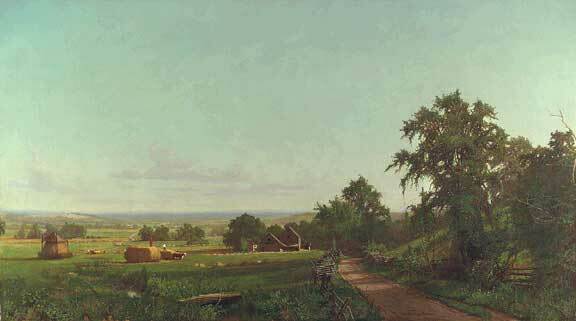 Other early settlers resting there include the Paxtants, the family for whom Harrisburg’s predecessor is named. Returning to the subject of the Pennsylvania-Maryland border feud, history records that within a decade after the death of the peace-loving William Penn in 1718, his sons received a request from the governor of the Commonwealth for troops to settle the property dispute with the Catholic State once and for all. The Penns apparently did better than sending soldiers. Just as King James had tried to do in solving “the Irish problem” by relocating Scottish and English “replants” to Northern ireland over a century earlier, in 1729 the Penns sent an assortment of 140 families from Ulster to take up lands and settle in the disputed area, today’s Adams County. The group was lead by another “Captain Hance,” for whom Hamiltonban Township is named. “Ban” means “lady” in Gaelic. The good captain thought of his land and this territory as a kindly partner in life. His son became a well-liked Sheriff of York County. In 1735, Lord Baltimore countered by granting 5,000 acres in what is now Hamiltonban to Charles Carroll. 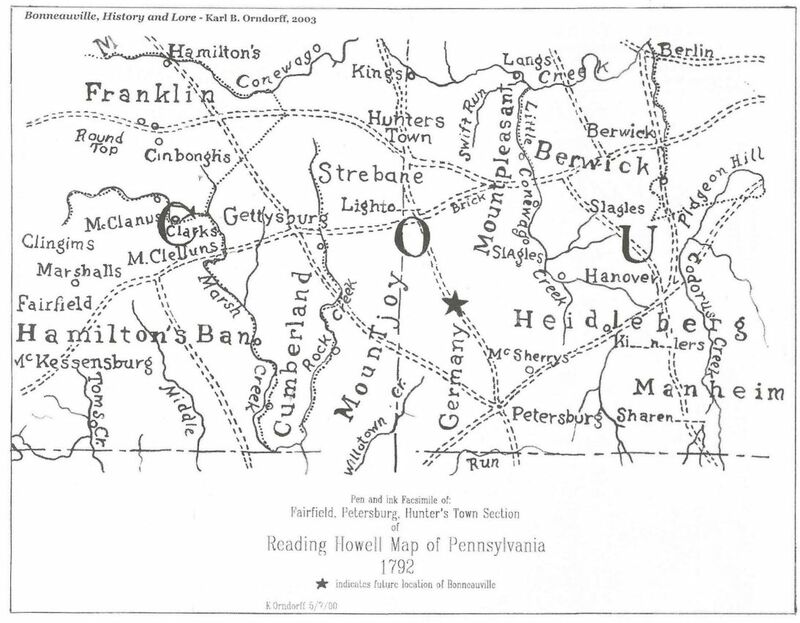 Carroll believed that the land was in Maryland, but it was not until the Mason-Dixon survey of 1767 that “Carroll’s Delight,” as it was called, was found to be in Pennsylvania. By then the old feud between states was forgotten. In 1740, in an apparent malicious change of heart, the Penn brothers ordered all the Scots-Irish settlers off the land of the newly claimed Manor of the Masque. After their well-know stubborn character, these families refused to leave. A letter dated 1741, written by Penn surveyor Zachary Butcher, tells of these “unreasonable Creatures” and how they threatened to “kill or cripple” anyone who would try to move them. Unfortunately, Butcher’s list of such creatures included our James Wilson. The issue was resolved when another agent of the landlords, sent to prosecute and remove “the squatters,” received further orders from the Penns to allow them to stay, farm the land, and organize a defense against Indian raids. They became the core of what was known at the start of the American Revolution as McPherson’s Battalion, and they eventually became the 11th Pennsylvania Regiment. They spoke bad Irish and as bad English, but their shout was heard unmistakably wherever the wave of revolution struck, and when with their brothers of the thirteen stars they raised the flag of the Union, they at that moment saw the shackles fall from the husbandman, and with industry and liberty march forward over the trails and military roads cut by the retreating soldiers of Great Britain. The good news is that our Wilson name doesn’t appear on the later 1765 list of squatters, and by 1792, James, Sr.’s grandson John is listed officially as among the original taxpayers of Hamiltonban Township. James Wilson, Sr.’s son David was a Captain in the 11th Pennsylvania Regiment during the Revolutionary War. His brother, our Grandfather James, Jr., died at age 32 of a disease contracted during that same war for independence. James III, our Grandmother Jane’s brother, represented Pennsylvania as a member of the 18th, 19th, and 20th U.S. Congress. He married Mary Reed, daughter of General William Reed of Revolutionary War fame. Mary’s sister was the first law professor at nearby Dickinson College along side Henry R. Wilson, Captain David Wilson’s son and professor of Latin and Greek. Henry was once president of St. John’s College in Annapolis. As we said earlier, many of these Wilsons are buried at Lower Marsh Creek Cemetery near Gettysburg. Today, the dispute over the land of the Penns, the Wilsons, and the Hills is confined to the history books. Unfortunately, the conflict that occurred a century later during the terrible three-day battle of Gettysburg is more familiar to Americans. By the time that struggle took place, our direct line ancestors had moved to Western Pennsylvania. Some of our young men, nevertheless, returned to Adams County and fought for the Union cause. There are plenty more stories of these families to discover and report as our research continues. We hope you enjoy reading about our families as much as we enjoy sharing their narratives. “Clan Boyd.” 10 April 2014. MacPherson, B.F.M.“County History.” Gettysburg Times. 26 April 1958. “Early History of Hamiltonban.” 10 April 2014. History of Adams County, PA. 1886. 10 April 2014. See also the various Family Trees, Vitals, and Tables of Contents. I have a suspicion. Did you know that 11 Wilsons, including at least one James Willson, were in Yohogania in the 1790 Census, and one of those James is known for a fact, but only by me, to have rented a cabin there, in what became Elizabeth Twp. Allegheny Co. Pa, but later Forward Twp., from William (1733) Applegate, and I have that proof. He may have been your James Willson? Also, where is that will? Very interesting information. Would the “proof” you have be able to connect my James to that census? As I’ve said, I have several other Wilsons in my lineage, so there could be other connections. Also, I’ll need to recheck my sources for the will you refer to before getting back. Thanks for writing, especially about the 1790 Census.